Adrian O’Sullivan is known to many in the ultra-racing world as the organiser of the TransAtlantic Way, but before that, he was an accomplished racer himself, finishing in the top 10 at both the Transcontinental Race and TransAm Bike Race. 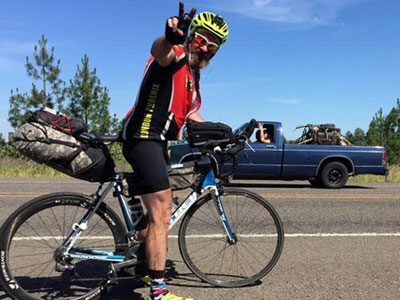 His experience over the years has allowed him to develop some strong views on ultra-cycling today, and his activity in the community is helping new people to discover it all the time. Here, Adrian tells us what inspired him to become an event organiser, what we can expect from the TransAtlantic Way in 2019, and how he sees the sport developing in the future. How did you get into riding ultra-distance events? My first ultra distance event was an Ironman. Like a lot of triathletes , I was a rubbish swimmer and slow runner, but my cycling seemed to be ok. In my 2nd Ironman I came out of the water 850th of 1000 swimmers, but after 180km on the bike I’d overtaken 700 other competitors and got off the bike in 125th place. Later that year, a friend sent me a link to the Transcontinental Race. I entered, rode from London to Istanbul, and my life took a turn. What inspired you to organise an event? Mike Hall inspired me. After riding in the TransAm Bike Race in 2015, I set out to create my own one, closer to home. Originally I’d planned a TCR light; A shorter training ride cyclists could use as a stepping stone to the TCR. Although I’d ridden and researched the route extensively, it wasn’t until we lined up in Dublin I’d find out: It was anything but a TCR-light. The first year we had 36 riders and I rode it too. On the first small climb in Donegal, just 300km in, I thought, "What the hell have I done?" It was a 20% gradient right into a Wild Atlantic Way headwind, and I could hardly ride up it. The route turned out to be incredibly tough, but we’ve had an amazing three years of racing, and this year we will be switching the focus from 'race' to 'ride'. On that note, what can we expect from the 2019 edition? I’m working hard to get 200 riders to line up in Dublin, with over 10% of them being women. We've introduced a second route option, which is slightly quicker and will allow more relaxed riders to keep up with the bunch. Hopefully we'll have a bit more rain too - so many riders were disappointed about the glorious sunshine last year, when Ireland had its hottest summer for 30 years! To be honest I’ve no idea though, it will be an unknown adventure for both the TransAtlantic Way team and the riders. What is ultra-racing all about for you? Digging deep and escaping the rat race. It’s the closest you can get to living like an animal. All you really have to think about is where you're going to eat, drink and sleep - for one to two weeks. Thats base living. It changes you; allows you to experience deep spiritual feelings and emotions. A rider said to me last year on the TransAtlanticWay, “It’s only the first day and I’m already crying.“ I understood exactly what he was feeling. What are the hardest and most rewarding parts of organising an ultra race? The hardest part for me is an overwhelming feeling of responsibility for the safety of the riders. Some of it is justified but mostly it’s unfounded and me being a mother hen. The most rewarding part is knowing you’ve created an experience that has the capability to change people, and to be part of something that gives more than it takes. How do you see the sport evolving in the future? I see the non competitive side of things growing, as more and more people search for an escape and an adventure. The competitive end is starting to change from when I started racing. It’s moving towards a more professional approach, with more and more riders employing personal trainers, nutritionists and devoting large portions of time to training. Power meters, super lightweight bikepacking setups and sponsorships are making it faster every year. 400km a day is being averaged by more and more riders every year, and considering they have to carry everything and look after themselves, that’s outstanding. The great thing about our sport is that it’s so much more than a race though. It’s an experience. An adventure. An odyssey. That’s easy. Don’t sleep behind the giant metal buoy at Mizzen head, it’s like a wind tunnel.